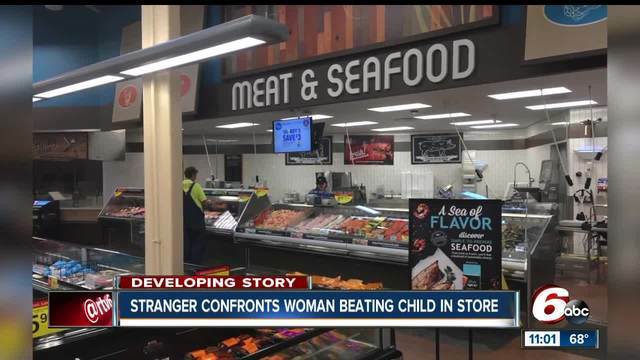 INDIANAPOLIS -- An Indianapolis woman says she couldn’t just stand by and watch when she saw a young boy being abused inside a grocery store. The Indianapolis Metropolitan Police Department is investigating the incident, which happened at the Kroger at County Line and Emerson Wednesday evening. Jeanna Aliff said she was standing by the meat counter just before 6 p.m. when she heard a woman screaming. “Everyone starts looking over because it’s really loud and causing a big scene,” said Aliff. Aliff said she then saw a woman violently shaking a young boy and hitting him. Aliff said she couldn’t just stand back and watch, so she walked over to the woman and tried to defend the boy, but the angry shopper told her to mind her own business. The tensions escalated between the two until Aliff said the woman turned around and smacked her. A store manager called police as Aliff followed the woman outside with her phone, taking photos of her as she got into her car and grabbing a photo of her license plate. So far, no charges have been filed but IMPD says they are investigating both the assault against the child and Aliff. She posted the encounter on Facebook in hopes of finding someone who knew the woman so they could get help for the young boy. Aliff said the post eventually got back to the boy’s mother who messaged her to thank her for sticking up for her son who had been staying with his grandmother for a few days.